This Thursday, on our journey along the footsteps of Polish filmmakers abroad, Polish Cinema for Beginners will visit Sweden. The next film presented in the 9th edition of our review is “Strange Heaven” by Dariusz Gajewski. The director will be our special guest at the screening. During the 9th edition of Polish Cinema for Beginners called “Poland Abroad” we take a look at how Polish filmmakers find themselves in the international cinematography and how do they describe the world out there. “Strange Heaven” takes us to Sweden, where we meet a Polish couple in crisis – a sports coach Marek (Bartłomiej Topa) and a masseuse Basia (Agnieszka Grochowska, awarded for her role at the festival in Gdynia). Their arguments have a negative impact on their daughter Ula, whose behaviour becomes worrying for the school and then for social welfare. To protect the girl from domestic violence, a social worker Anita (played by Ewa Fröling, memorable from Fanny and Alexander by Bergman) takes action and transfers Ula to the foster family. The parents are starting a dramatic battle against bureaucracy to get their own daughter back. Strange Heaven provoked discussion about the condition of the Polish family and the limits of interference in their affairs. 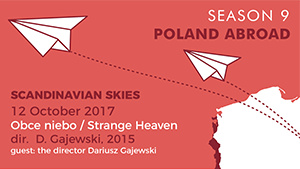 The special guest of the second screening of the Polish Cinema for Beginners’ 9th season will be Dariusz Gajewski, director and screenwriter of the “Strange Heaven”. Gajewski is the Vice President of the Polish Filmmakers Association, member of the Polish Film Academy and the European Film Academy. His famous Warsaw (2003) was a great discovery of the Gdynia Film Festival, where it was honored with the Grand Prix Golden Lions for the best film. Among others, it was followed by the films: Mr. Kuka’s Advice (2007) and Strange Heaven (2015), which won at the Off Camera Festival in Kraków. The meeting will be hosted by Adam Kruk, who is responsible for the Polish Cinema for Beginners programme. The screening of “Strange Heaven” will take place on October 12th at 8:00 pm in the New Horizons Cinema. Tickets can be purchased before the screenings at the ticket offices and at KinoNH.pl website. More information about the project can be found at: PolishCinema.com.pl and facebook.com/PolishCinema. You are invited to the Polish Cinema for Beginners by the Wrocław Film Foundation.